Nickname: The Old Blind Man. 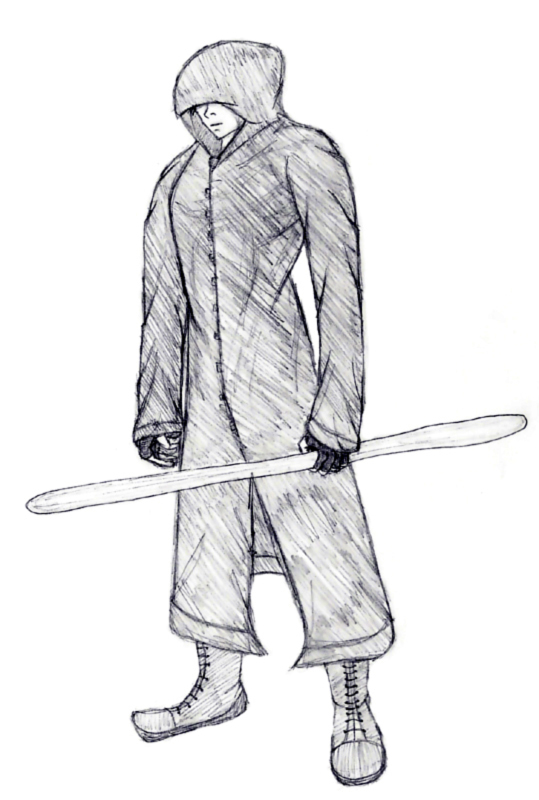 Appearance: Bura is always seen wearing his brown cloak and robe, which covers most of his body. The hem comes down to his feet, but not quite dragging along the ground. Some of his shoes are visible, which are also brown, so blend in quite well with the cloak and robe. The cloak and robe are matching brown colour and made of 100% cotton, making them soft to the skin and flow gently and aerodynamic. He is usually seen wearing his Kage hat, which is brown and white with the symbol of the Earth Shadow on it. Bura wears the customary ninja sandals, but in brown. The sleeves of Bura's robe are thick, allowing him to hide things up there. He wears a necklace around his neck, made of silver. It has a symbol of a heart on it, but Bura has never explained it's meaning to anyone. Bura is bald, having shaved off all his hair from his monk days and keeping his hair that way. Unlike some biggoted fools who are bald, Bura does not shine his head. Bura is noticeably blind and has a red slash scar across his eyes and the bridge of his nose, from where a blade cut him and destroyed his vision. Bura keeps his eyes closed at all times, as it helps him concentrate on his other senses and he knows the absence of eyeballs freaks out some people. He may show his grotesque appearance during battle to unbalance his opponent's focus. Before his eyeballs were surgically removed, they used to be a piercing emerald green. Before his hair was shaved off, it was a mousy brown. His head is often hidden by the hood of his robe which is up, under his Kage hat, but it is sometimes visible. He has tanned skin and it is slowly starting to wrinkle and show other signs of aging. Ninpō: "The smallest breeze can cause a current in the largest ocean."